Ah St. Patrick’s Cathedral! Stirs so many fond memories. “Addressing some 3,000 people, most of them clergy, he called it a time for purification and healing. “I simply wish to assure you, dear priests and religious, of my spiritual closeness as you strive to respond with Christian hope to he continuing challenges that this situation presents,” Benedict said. “Saturday was the third anniversary of Benedict’s election as pope and he was feted by cardinals and bishops, priests and nuns who jammed the magnificent Gothic church on Fifth Avenue. Sure. Just like. . .
“Benedict then led a procession out the center aisle, blessing the cheering worshippers. Upon arriving, he was met outside by Mayor Michael Bloomberg, while former Mayor Rudy Giuliani was inside. Like Britany Spears. Only wrinkled. “The Vatican said the German-born pope came outside from his residence on the Upper East Side Friday night to greet a crowd of more than 500 people who had lined up for hours. He shook hands and blessed the crowd before returning inside. At the cathedral, Benedict touched on the theme of his trip – Christian hope – saying he wanted to communicate the joy born of faith to a cynical world. And he’ll take charge of the good ones. . .personally. .
“A top Vatican official now says the Roman Catholic Church is weighing a further change to clean up the clergy: revising church law so predators could be more easily removed. “It’s possible,” said Cardinal William Levada, head of the Vatican office that reviews abuse claims against priests worldwide. They’ve got to clear it with the lawyers first. “It is the latest signal during Benedict’s first papal visit to America that he is intent on purifying the priesthood as he affirms traditional Catholic practices and teaching. “Still, Benedict has offered support to America’s clergy during his visit. Hey, it was the 60’s. Or maybe — yeah it was the 50’s. Yeah it was really bad having to recall those priests from Palm Springs and all. “However, morale has been improving as the intensity of the crisis has eased. Yet Catholic clergy face other challenges beyond fallout from the abuse problem. 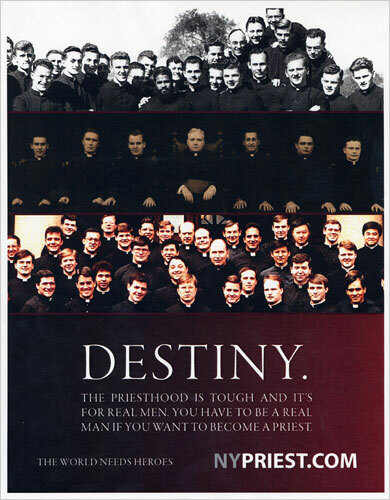 The priesthood has been shrinking for decades. More than 3,200 of the 18,600 U.S. parishes don’t have resident priests, according to the Center for Research in the Apostolate at Georgetown University. More lay people than clergy work full-time in the churches. “Dioceses have been hiring recruiters to travel overseas to find clergy candidates. The number of priests from other countries has grown so steadily that some seminaries are adding English classes, hiring accent reduction tutors and providing courses on American culture. Hey Ratzi, isn’t that what got you guys in trouble to begin with? Clearly indicative of the fact that The Church needs a savior — someone as Clean and Pure as a New York Yankee. So take it away, Rae Allen! He’s Shoeless Joe From Hannibal Mo. It’s Shoeless Joe From Hannibal Mo.